When we got a val-pak coupon for this new restaurant in our area we were really excited because on the coupon it exclaimed things like: “vegetarian options!”, “organic herbs!”, “wild caught fresh seafood!” We thought for sure we would have tons of healthy, non-meat related, locally sourced options. Sadly, once we looked over the menu we quickly realized that was not the case. There was a grand total of ONE vegetarian option on the main courses section of the menu- and it was vegetable curry. There was also ONE veggie sandwich option and 2 vegetarian pizza options. I don’t know about you, but personally, if I want curry, I’ll go to an Indian or Thai restaurant. I am not really interested in going to a ‘Rustic Pub and Grill’ that specializes in burgers and wood-fired pizzas and then ordering a curry dish. Humph. We thought, well, luckily, we are pescetarian…surely there will be wonderful fish options. There was ONE. It happened to be the one type of fish that neither of us really like, and one of the most expensive choices on the menu. Womp womp. We decided we’d be best off ordering some small apps and salads to share. When we found out that the chef makes all of the cheeses there, we decided to try some dishes that highlight that. The 2 salads (house and jewel) we shared were both very good- even if not totally exciting. They were full of fresh veggies, homemade cheese (mozzarella and goat) and really outstanding citrus vinaigrettes (one was lemon and the other orange and they both had bright, fresh, fruity flavors to them). Soon after we finished our salads, our waitress brought us out some beer biscuits which were moist, crunchy, lightly sweet, and soooooo good. The fact that the rolls came after the salads was kind of odd, but better late than never. At this point, I mentioned to the waitress that I’d love to meet the owner/chef- who is apparently also from NY. This is a new restaurant, and as a blogger who loves to hear the backstory of a vision like this, I always try to get a chance to chat with the person who dreamed it up. I was told that she was there and would be told that I’d like to meet her…but that was the last I heard of it. She was apparently hanging out in back and couldn’t be bothered to come say hello. The manager did come say hi, but honestly, meeting him really wasn’t what I was looking for. Oh well….I guess a little blogger like me isn’t important enough to greet personally. Next, our avocado and gulf shrimp cocktail came out. It was a total disappointment, nearly drowned in a mayo-based sauce. 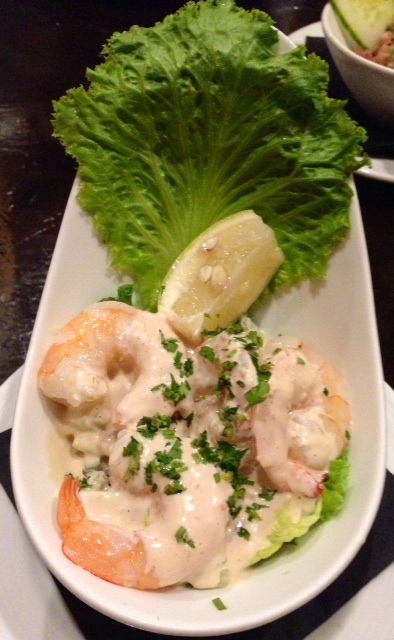 The shrimp were plump and cooked well, but the goopy sauce totally ruined the dish. There were 2-3 tiny pieces of avocado- not the chunks that the menu description promised. The tuna tartare was similarly ruined, swimming in too much soy sauce. Raw tuna is such a wonderful consistency and covering it with the soy seemed to turn it into salty mush. The flavor that it carries naturally was overpowered by the sauce and I honestly couldn’t even eat my half. The presentation was lovely, but a dish should never look better than it tastes. Our fifth and final dish was the redeeming factor. The homemade almond crusted brie was glazed with apricot and served with crispy ciabatta, blackberries and apple slices. It’s melty, oozy, warmth was full of flavor and creaminess. We seriously cleaned that plate in record time and kind of wished there was more- although the portion was perfectly generous. It was clear to us that this chef’s real gift is in her ability to make outstanding homemade cheeses. Knowing that now, I might consider going back to try the pizza- although it really wasn’t what I was in the mood for at this visit. It also makes it’s even weirder to see a curry option on the menu, and I’d suggest to the owner that maybe that veggie offering should be reconsidered. Maybe a baked veggie parmesan dish would be a better choice where she could really show off her cheese skills instead of diving into the unrelated curry territory. Don’t get me wrong, since I didn’t even try it I realize there is a possibility that it’s great…but seeing it on a menu where it really didn’t seem to belong was just sort of off-putting. Overall, the atmosphere really does have an upscale sports bar/pub kind of feel to it. The lounge area is cozy with couches and a fireplace, and If I liked sports and/or beer, it would have been really appealing. As it is though, I really just like food…and that wasn’t good enough to make me ooh and ahhh over Rev-el-ry. Maybe it’s worth trying one more time after they’ve been opened for a year or so…Maybe they are still ironing out the kinks since they’re pretty new. I’ll give them the benefit of the doubt this time, but there is definitely quite a bit of room for improvement. NYC vocalist/voice teacher/running addict dines and cooks. I run so I can eat. I will sing for my supper. I will try anything twice. Cookies United LLC: 141 Freeman Ave, Islip N.Y.
Blu Kouzina: 25 N Blvd of the Presidents. Sarasota FL.